TOP: Loy Coin, 79, right, has clerked at the historic Tuba City Trading Post for 44 years. She has seen it transform from practical shop for local Navajos to a tourist attraction offering high-end jewelry and rugs from around the area. 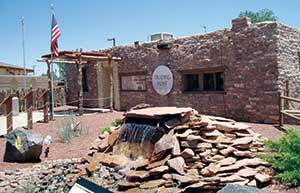 BOTTOM: The 125-year-old Tuba City Trading Post, now owned by the Navajo Nation Hospitality Enterprise, recently added a landscaped courtyard with interpretive signs. If there is one chapter that encapsulates the history of the Navajo Nation, it would have to be To' Nanees' Dizi. Hopis, Paiutes, Spanish friars, Mormons, soldiers, uranium, the Bennett Freeze -- all these and more have influenced the tangled story of the area known in Navajo as "Tangled Waters." Most recently, the chapter -- actually a fully certified local governance entity -- came under attack by its own leaders. In 2011, an audit uncovered the recently instituted Council of Nataanii -- the alternative form of government the chapter chose after certification -- had paid themselves illegal bonuses totaling $80,000. The officials were removed by Navajo Office of Hearings and Appeals, and the chapter was closed for months until residents complained they couldn't get necessities like firewood. But this is a resilient place with resilient people, and to visit To' Nanees' Dizi now -- with its thriving motels, convenience stores and restaurants, its skate park, historic trading post and new justice center -- you'd have to be in the know to see anything amiss. "We're picking up the pieces and putting it back together," said Delilah Endischee, the new acting chapter manager. "Internally, we're doing a lot of stuff to be transparent and provide better services. I'm optimistic." Embezzlement is certainly not the worst thing this fertile lowlands has survived. Spanish missionaries looking for converts and rumored riches first arrived here in 1776, finding the already long-settled Hopi village of Moencopi. Nomadic Navajos and Paiutes had seasonal camps in the area as well. For the most part, the Diné managed to stay out of the subsequent conflicts between the Spanish and the Hopis. Later, when the Americans came to round them up for the Long Walk, word had already arrived in this far western area and many families had already escaped to the intricate canyon country to the west and north. But when a group of Mormon pioneers arrived in 1870, claiming permission from their first Hopi convert, Tuba (more accurately spelled Tuuvi), to settle the area, tension set in. Name: To' Nanees' Dizi is usually translated as "Tangled Water," "Scattered Water" or "Braided Water," possibly referring to the network of washes that crisscross the fertile grasslands during rainy seasons. The name was changed from Tuba City Chapter several years ago when the chapter became certified under the Local Governance Act. The main community in the chapter generally still goes by Tuba City. "Tuba" does not refer to the instrument but rather to a Hopi whose name is also spelled "Tuuvi," "Tuva" or "Tubi" in historical accounts. He was the first Hopi convert to the LDS Church and became something of a celebrity, even being brought to Salt Lake City for an audience with Mormon leader Brigham Young. Population: 9,265 at the 2010 Census, surpassing for the first time Shiprock Chapter, at 9,126. Major clans: Táchii'nii, Kinya'áanii, Tó Dich’inii. Assets: Many businesses, tourism, good farming and grazing land. Issues: Overgrazing, desertification, unreclaimed uranium sites, former Bennett Freeze area, a 2011 embezzlement incident still under investigation, confusion over time zones (on the edge of the reservation, some businesses and governmental entities observe Daylight Savings Time while others do not). The Diné, freshly back from Fort Sumner, were looking for pastures to expand their herds of sheep. The Mormons were banking their fortunes on cattle, especially their leader, Lot Smith, who established the expansive Circle S Ranch to support his eight wives and dozens of children. The Hopis, with their small dry farms, were less of a threat to the expanding Latter-day Saint community, and the Mormons helped them build a reservoir, leading to even more resentment among the Diné. The low point came in 1892 when Smith was shot to death by a Navajo rancher (for a full account of this incident, read the Navajo Mountain installment of this series). Skirmishes over land continued until 1900, when the U.S. Congress expanded the Navajo Reservation to include Tuba City and its environs (except for Moencopi, which remains to this day an island of Hopi land; a small Paiute settlement is located at Bitter Springs). Three years later, the government bought the Mormons' improvements and ordered them to leave. A bright spot in the relations between white and Navajo residents of Tuba City was always the trading post, established in 1870 by Charles Algert but owned by the Babbitt family from 1905 until it was sold to the Navajo Nation Hospitality Enterprise in 2000. 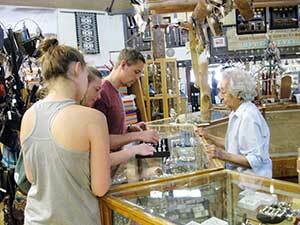 The present clerk, 79-year-old Loy Coin, has worked there for 44 years and watched its fortunes boom and bust with the uranium mines; its wares gradually change from Navajo necessities to tourist souvenirs. She has fond memories of the Babbitts. "They were good to us in our paychecks," she said. "They helped us get insurance." In the 1980s, the Babbitts started remodeling the store to bring it back to its original look, and the inviting, hogan-shaped stone structure is today one of the most photographed buildings on the Navajo Nation. It also holds a convenience store that still stocks Diné-preferred items like enamelware and Bluebird flour, and a nicely presented Code Talker museum. Across a prettily landscaped courtyard with interpretive signs sits the Explore Navajo kiosk that was taken to the 2002 Winter Olympics in Salt Lake City. Via imaginatively presented exhibits, tourists can learn about Navajo culture and history. A short drive west of Tuba City at the turnoff to Moenavi (watch for the sign) are some of the best-preserved dinosaur tracks in the Southwest, indicating a variety of species and individuals. Jewelry vendors have capitalized on this attraction, and a good variety of crafts can be purchased at competitive prices. Farther in on the same road is the Tutuveni, a series of rocks where Hopi clans left their clan symbols on the way to the Hopi Salt Trail near the confluence of the Colorado and Little Colorado Rivers. Visitors to this delicate and sacred site must get permission first from the Hopi Cultural Preservation Office. Locals in the Navajo Nation's most populous chapter enjoy a public library, a skate park and a choice of two high schools, the public Tuba City High and Greyhills Academy, run by the BIE. A modern Internet café, Hogan Espresso, provides a hangout for teens and 20-somethings and is a popular venue for local musicians. Less than an hour and a half from either Flagstaff or Grand Canyon National Park, the main community of Tuba City is not only the largest town on the reservation but the second-largest community in Coconino County. Some of the chapter's many uranium mining and milling sites have been reclaimed, with more in line for federally funded remediation. And with the Bennett Freeze finally thawed and the chapter getting its finances back on track, infrastructure development in that beleaguered area is poised to proceed. And Endischee wants you to know something more. In spite of what happened in 2011, "This is a nice chapter with a lot of nice people," she insisted. "I just hope your article sends a message that we are cleaning house and moving forward."